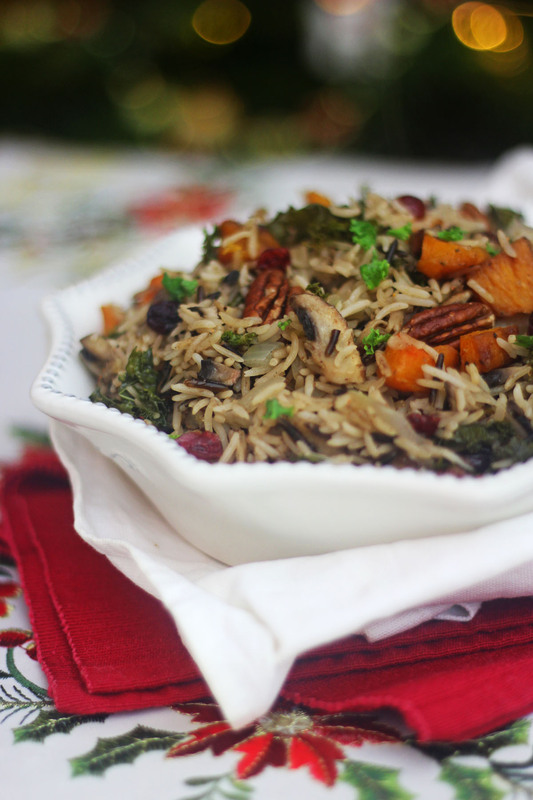 This Winter Wild Rice Pilaf is made from seasonal vegetables like Butternut Squash and Kale as well as festive spices which help turn this light dish into a warming meal. Read on for the recipe. After my rather decadent trip to Frankfurt last weekend I seriously needed some vegetables. I had spent 3 days eating delicious, hearty German food (think schnitzel, Bratwurst etc) and was craving something green and leafy on my return. Fortunately for me there were some rather sad and sorry looking vegetables lurking in my fridge. There were mushrooms, kale and butternut squash – seasonal veggies that with a little bit of love could turn into something delicious, light and healthy. Just what I needed. I came up with the idea for this dish because I’m a huge lover of winter spice. Whilst I wanted something that would satisfy my need for something jam packed full of nutrients and goodness, I equally wanted something warm and comforting. Fresh ginger, cinnamon and a hint of chilli gave me the heat I needed. They are also spices well known for their healing properties so an extra health benefit there too! Although we served this as a dinner in it’s own right, I could equally see this served along side a whole host of roast meat joints at Thanksgiving, chicken breasts mid-week and more. If you want to serve it as a side then simply halve the portion sizes and the recipe below should be enough for 4 people. 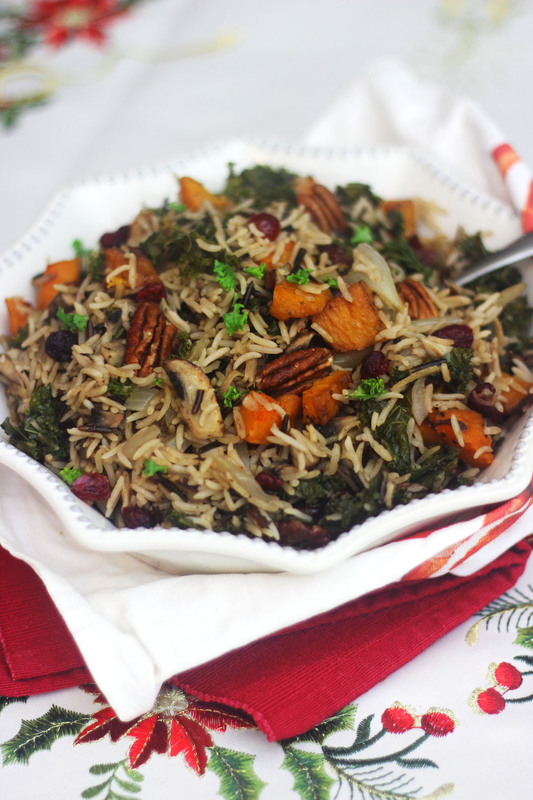 What I love about this dish is that in one mouthful you get sweet butternut squash and cranberries, earthy wild rice and kale, as well as the warm spices and the crunch of the pecans. What more could you want in a dish? Roughly 1 hour before you intend to serve your dish, place the cubed butternut squash into an oven dish along with a drizzle of olive oil and a little salt and pepper. Roast in the oven for half an hour. Once the butternut quash is soft, remove from the oven and place to one side. In a large flat bottomed frying pan, fry the onion in a little oil for 5 minutes or until it becomes translucent. Add the spices and cook for another 2 minutes until the armoas begin to release from the spices. Stir the rice into the onions and cook for two minutes allowing them to soak up the spiced oil. Pour over the water and cook for another 5 minutes. Next, add the mushrooms and cranberries to the pan. Cook for 5 minutes until the mushrooms are cooked and the rice and cranberries have absorbed the water. In the last 5 minutes of cooking add the butternut squash, kale and pecans to the pan and allow the flavours of all of the ingredients to cook together. Once all of the vegetables and rice is cooked through, it is ready to serve. If I haven’t already persuaded you that this dinner is truly delicious then perhaps this will persuade you – it’s a quick and easy meal that can easily be thrown together after work as we did. It’s also a one-pot wonder meaning that you can spend more time snuggled up under a blanket on the sofa and less time at the sink doing the washing up. Hurrah! Now that I’ve got a belly-full of veggies I’m feeling much better. My friends and I often joke that I should move to Germany as I’d fit in so well with the culture but if I did I think I’d double in size! For now I’ll stick to eating vegetables and maybe in a week I’ll be able to stomach another schnitzel…Enjoy! This dish includes so many of my favourite winter ingredients that i’m going to have to try it out over the coming weeks. A great idea and lovely as a side dish or the main meal itself and not too complicated either! Thanks Laura! I was quite impressed that I had all of the ingredients lurking in the back of my fridge and cupboard. But they are some of our favourite winter ingredients too so we always seem to have them to hand. I love Pilaf, and I love how you added so many ingredients that I really love (squash, mushrooms, and cranberries) I will have to try this! yum! Thanks Kate 🙂 I’m glad you like it! They are some of my favourite foods too! This looks really yummy, I love rice with bits in it and all those bits you’ve added are so very delicious. Great recipe!